If you really want to enjoy your vacation, you should rent a vessel with a crew. Antropoti Team can provide you professional skippers, the best chefs, hostesses, floral decorations, catering, gifts, free grocery shopping and delivery and anything else you might want and need and make sure that you absolutely enjoy and have fun in Croatia. Skipper is the captain of a smaller vessel. He drives the boat and keeps it in order, takes care of the paperwork in ports and marinas, transfers the vessel from one marina to another between the charters (if necessary), answer all of the guests questions, suggest itinerary and activities, help them with any possible problems and takes care of the guests. Also he is there if there is no hostess on board, he sometimes prepares the meals and cleans up after the guests. The hostess is on board to take care of the guests’ needs, prepare meals and keep the boat in order. Together with the skipper (or the other crew members) she cleans and tidies up the boat and cooks for the guests. 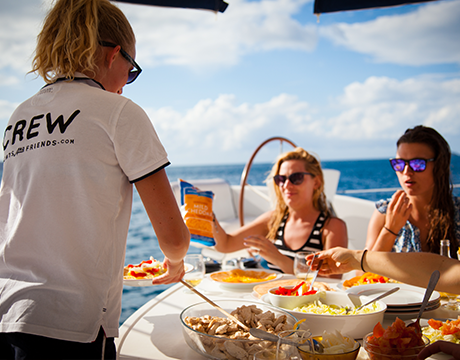 The cook can or doesn’t have to be included in the crew; it depends on boat size and guests’ wishes. If there is no chef on board, the captain, skipper or the hostess are taking care about a meals. Chef like a member of the crew is completely in charge of food and beverages, planning menus, cooking according to guests’ wishes and serving the meals (if there isn’t anyone else who would do that) but also for buying and ordering groceries.